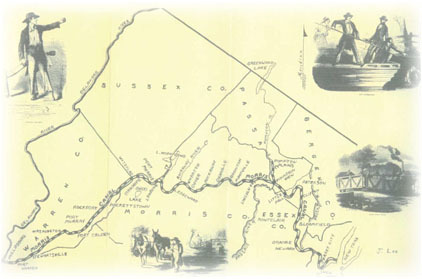 The Morris Canal connected the Delaware River at Phillipsburg, New Jersey with the Hudson River at Jersey City. An engineering marvel of its time, it climbed 914 feet and descended 760 feet through 102 miles by means of locks and inclined planes. It was originally built between 1825 and 1836, primarily for transporting anthracite coal from Pennsylvania mines to eastern markets. The canal's original Jersey City terminus was the Little Basin, which is now the northeastern boundary of Liberty State Park. However, the need for additional docking and navigating space led to the construction of a larger basin. The Big Basin, with its extended piers and wharves, was constructed in 1859. 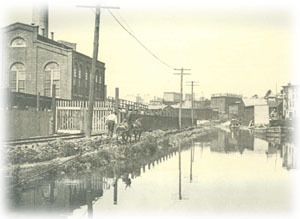 The Morris Canal operated for nearly a century but was successful financially only in some of its early years. It diminished in importance as railroad competition grew, and it was finally abandoned in 1924.